Now this is not a list of the trendiest bars, nor a list of bars that “go off” etc. It focuses on bars that have unique ideas or themes. And it focuses on you not having to go broke to enjoy them. 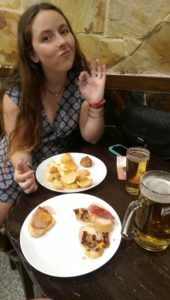 I also have not visited every single bar in Europe; this is a selection of my favourites from my experiences. It gets a bit nerdy here and there, but you are bound to have a heap of fun at my top 5 bars of Europe. This is the sort of place you dream about as a kid (minus the whole alcohol aspect). Heaps of rooms filled with TV’s and various gaming consoles with tonnes of games that you can play with your mates or strangers for free. This being Poland, the drinks are also really cheap. I had a delicious Budweiser (for about AUD$2) while Kassy had a well-priced cocktail. We collected some equipment from the bar and headed into a room to have a serious guitar hero session. 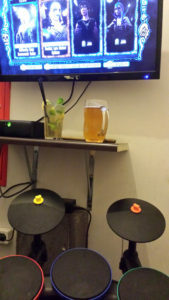 Yes, a pub where I can smash the plastic drums of guitar hero while enjoying a cheap, quality bear – I was in heaven. A friendly local Polish guy even came in for a jam with us. In fact, I’m devastated that I only got to enjoy one night at this place. If I had a similar pub nearby it would undoubtedly be my local and I dare say my alcohol intake would increase dramatically. I’m a sucker for a freebie. So as soon as I heard there was a pub that offered free food I was like road runner, getting to the venue in question as fast as I could. These magnificent establishments (there are a 3 of them) in Madrid boast free plates of tapas with every beverage you buy. And it’s not a small serving of one or two tapas either, it’s a big full plate. Kassy and I bought a beer each, which cost us €7.50, and ended up with almost enough food for the both of us for dinner. Cheese and bacon balls, baked potatoes, bread and ham/cheese/salami and more. Awesome. This crazy little bar in Barcelona goes mental with students and travellers each night. Chupito’s boasts over 600 different types of shots including heaps of novelties to go with them – for only €2 each. There are shots that are set on fire (and sometimes have marshmallows roasted over them), shots that have lollies in them and shots that require you to don a helmet and get belted in the head with a rubber mallet by the bartender before you are allowed to consume them. It’s an endless amount of fun. I requested a shot that I’d been taught previously – that involved setting it alight before placing your palm over the shot, resulting in it sticking to your hand. It worked perfectly the first time, but I did something wrong on round two and ended up burning my hand (I think I may have taken too long to put my hand on, allowing the fire to heat up the glass too much). Going back to the theme of games, the Hillhead Bookclub in Glasgow’s trendy West End was a solid competitor to the Cybermachina Game Pub – purely because of the retro factor. Upstairs they have a little old TV set up with a Super Nintendo and a full box of games. If that’s not to your liking there are also Ping Pong tables. On the week night we were there the drinks were super cheap – a pint for £2.50, spirits for £2. They were thoroughly enjoyed whilst we churned through some solid, classic Super Mario World. You can’t beat that for drinks and entertainment. The DJs roll up on the weekend and so do the crowds – so if you go on the weekend get there early, because this place fills up and lines can be huge. Somehow I don’t think Czech franchise “The PUB” would pass Australia’s RSA laws. This bar encourages competitive drinking. If you’ve got scores to settle with a mate or group of mates, this is the perfect place to do it. Each table is fitted with its own beer tap and you help yourself. Consumption is tracked by seat number and a leader board of who’s drunk the most beer is shown. 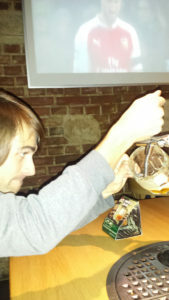 Not only this, but there is a pub wide and even worldwide leader board shown for the night, focusing on the top tables. You and your mates can literally take on not only other tables in the same pub, but tables in pubs all over the Czech Republic (and a couple outside in Austria and Germany). However, good luck on getting your name onto the top of the all-time leader board. 29 pints in a night? Maybe only Boony could top that. If you’ve found some awesome bars around Europe, let us know below!